Olathe, Kansas is the fifth most populous city in that state with a population of about 130,000 residents. It is located within Johnson County and it is also the county seat there. It is a suburb of Kansas City but it is the fourth largest city in the Kansas City Metropolitan Area. CNN/Money ranked Olathe number 11 on the list of 100 Best Places to Live in the United States and it was also ranked the 24th fastest growing city in the nation. 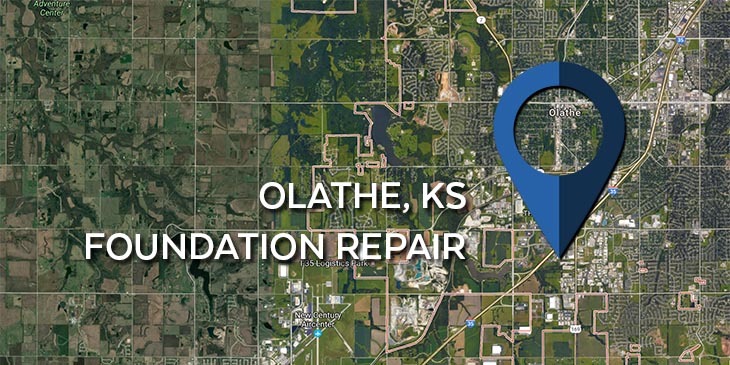 To all those residents who need foundation repair in Olathe KS or in any of the surrounding areas, KC Pro can help keep your home safe and sound. The founder of the city Olathe was Dr. John T. Barton. He thought the land was very beautiful so he asked a Shawnee interpreter how it is said in his native language, and he replied with “Olathe.” In the early days there was a lot of violence in the city, but when Kansas was a free state in 1861 the violence lessened. Olathe was a stop on the Oregon Trail, the California Trail, and the Santa Fe Trail. It served as a place for travelers to resupply their wagons while heading westward. While living in Olathe if you notice that you are having foundation problems in your home such as cracks, leaning walls or chimneys, or a sinking foundation, then KC Pro can solve your foundation issues. For foundation repair KC Pro fixes your home issues so it is safe and sound. KC Pro has several foundation repair systems to overcome the damage already done. Our expert contractors will use Helical and Steel piers to provide additional support to your homes foundation. These piers are used in a process called underpinning. Our team will drive the piers deep into the soil underneath your home until they reach the stable footing of bedrock. From there, the opposing end is placed underneath the foundation, essentially, propping it up and relieving stress. Unfortunately foundation damage and water seepage often come hand in hand. Water takes the path of least resistance, so if your home has cracks then you can be almost certain that moisture will find it’s way into your home. Water brings a slew of additional problems with it, the longer you wait the more expensive it could become. Not only do we handle foundation repair, but we also provide basement waterproofing services. We have many waterproofing services to assist your home, so that you do not have to worry about the rain flooding in your basement. Whether you need wall crack injections or exterior waterproofing, we can handle it all. Our professionals can handle all your basement waterproofing problems.